beaches. We took a day off to buy our season pass to the national seashore and to spend a full day at the beach. This picture is Race Point beach in Provincetown. We have lived in Brewster for almost six years now and are continually amazed and in awe of how unique and different each beach, both bay and ocean sides, is on the Cape. Thankfully the national seashore was established in 1961 to help protect many of the beautiful beaches on the Atlantic side. 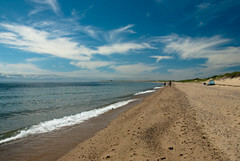 The National Seashore contains 44,000 acres along a 40 mile section of the coastline between Chatham and Provincetown. The Cape is actually a glacial deposit that is continually undergoing changes as winds and water move sand along the shorelines, tearing away one place and building another. Art’s Dune Tours in Provincetown is a must do if your Cape Cod vacation is 4 or more days. You can get a good sense of how quickly things are changing by looking at the diminishing beach at the Marconi Station Site in Wellfleet, where the peninsula is only a mile wide. Much of the high cliffs has eroded since Guglielmo Marconi first built his towers there in 1901. Changing too, though not so perceptibly is the Cape Cod Bay shoreline. Great Island in Wellfleet, where whalers used to congregate, can be explored via trails and one can walk out to the tip during low tide.It’s hard to believe that houses use to exist many years ago on that thin peninsula. So, the big question that we love to ask our guests is what is your favorite beach? We have many favorites! We love our Brewster flats which is just a short walk from our inn. 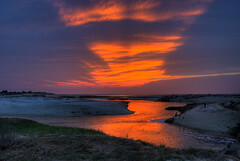 Paine’s Creek is a photographer’s haven at sunset when the last rays of the day cascade beautiful colors over the bay. We also enjoy Nauset Beach and have marveled at the dedicated surfers that continue their sport in the colder months. We love Marconi for the beautiful waves and love to collect stones on Coast Guard beach. We recently enjoyed a tour in Provincetown with Art’s Dunes Tour. What a hoot…..we were fortunate to have the owner Robert Costa as our tour guide who added much history about the dune shacks and marveled at the natural beauty of the dunes. During our last trip to visit Race Point Beach we picked up a newspaper outlining all of the summer activities coordinated by the National Seashore.The list was impressive and has different activities to appeal to all age groups.One can learn about snorkeling, tour the three sister lighthouses, learn about the history, take a guided walk on Nauset Marsh or join in on a campfire. Check out the FRIENDS of the Cape Cod National Seashore to see how dedicated Cape codders, even us washashores are, to the majesty of our national treasure. A challenge to each and all: just try to find the definition to washashore. We were assured when we first arrived that one would be a washashore unless you and your relatives had lived here for 6 generations. This entry was posted in Uncategorized and tagged Cape Cod Activities by Amy Chesnut. Bookmark the permalink.